Israeli soldiers closed, on Tuesday afternoon, the al-Lubban School for Girls, south of the northern West Bank city of Nablus, after threatening to attack it with gas bombs. 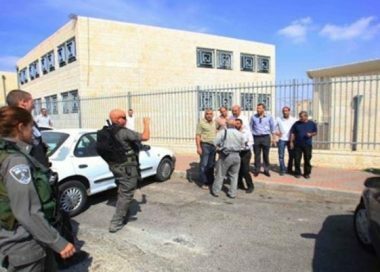 ‘Aisha Nubani, the principal of the school, told the WAFA Palestinian News Agency that the soldiers ordered the instant evacuation of the school, allegedly after a colonialist settler’s car crashed into another car when Palestinian youngsters hurled stones at it, near the educational facility. The soldiers threatened to fire a barrage of gas bombs into the school unless it is immediately evacuated and closed. The soldiers chased many students in the meadows surrounding several schools in the area, near the main Ramallah-Nablus road, which is also used by the military and colonialist settlers. 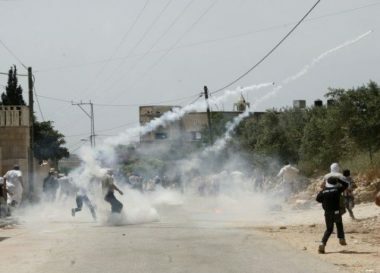 Israeli soldiers fired, on Tuesday morning, several gas bombs at schoolchildren in Abu Sneina neighborhood, in the southern part of the occupied West Bank, causing many children, and other Palestinians, to suffer the effects of teargas inhalation. Eyewitnesses said the soldiers fired the gas bombs into the Nahda School, and its surrounding areas, and added that local medics provided the needed treatment to the wounded children. They added that several Palestinians then hurled stones at the soldiers, who fired more gas bombs, and concussion grenades. On Monday afternoon, the soldiers also fired gas bombs at students of the same school, causing many to suffer the effects of teargas inhalation. 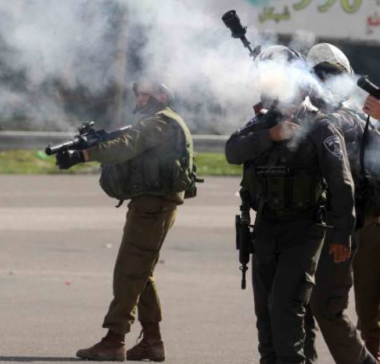 Israeli soldiers injured, Tuesday, many Palestinians, who suffered the severe effects of teargas inhalation, in addition to cuts and bruises, near Abu Dis University, in Abu Dis town, southeast of occupied East Jerusalem. Media sources said several army jeeps invaded the town, on Tuesday morning, before advancing to the Schools Street, leading to Al-Quds University. They added that several young men hurled stones and empty bottles at the invaded army jeeps, while the soldiers fired a barrage of gas bombs. Dozens of Palestinians suffered the severe effects of teargas inhalation, and receiving the needed treatment, without the need for hospitalization. 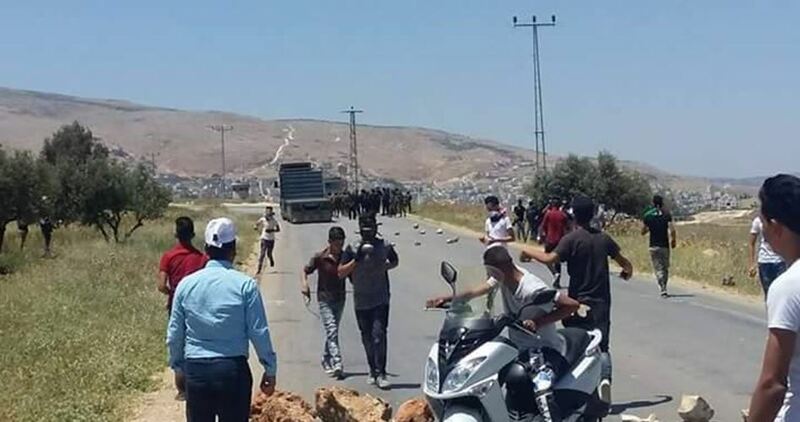 A number of Palestinian youths were injured in clashes that erupted on Sunday between Palestinians and Israeli occupation forces (IOF) in Bourin town south of Nablus city in the northern West Bank. 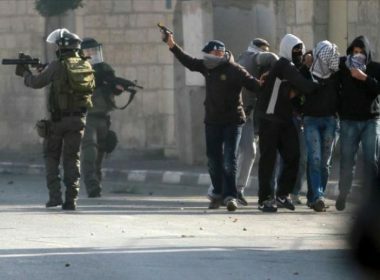 Local sources as well as head of the town’s council said that IOF soldiers attacked a high school in the town and chased the students at the pretext of throwing stones at cars of settlers. Two students were shot and injured by Israeli rubber bullets while many others suffered breathing problems as IOF troopers fired tear gas canisters towards the protesters during the clashes. One of the wounded was shot in the head while the other one was injured in the foot. Both injured students were moved to Rafidiya governmental hospital for treatment. Israeli soldiers invaded, on Wednesday morning, the al-Mughayer Palestinian village, east of the central West Bank city of Ramallah, before storming into a school, and a kindergarten, and injured eight, in addition to abducting three young men. The principal of al-Mughayer Secondary School and member of the village’s Local Council, Marzouq Abu Naim, said the soldiers invaded the local school for girls, and used it as a military post, in addition to the al-Mughayer kindergarten. He added that the soldiers also invaded and searched many homes in the village, and the local mosque. Several youngsters protested the invasion, and hurled stones at the armored military jeeps, while the soldiers fired rubber-coated steel bullets, wounding eight Palestinians. 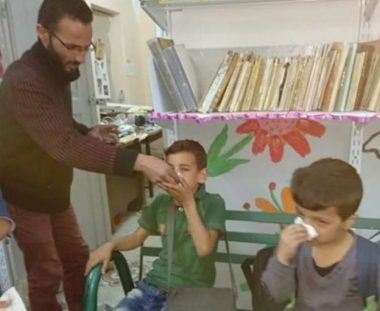 The soldiers also fired many gas bombs, causing dozens of Palestinians, including children in the kindergarten, to suffer the effects of teargas inhalation. 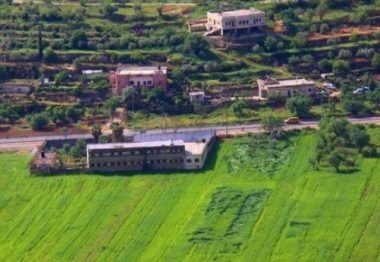 Naim Abu Ata, the head of the Local Council, said undercover soldiers also infiltrated into the al-Mughayer School for Boys, assaulted ten students with clubs and batons, and abducted three. As Palestinian children were heading to school on Wednesday morning, Israeli soldiers entered the central occupied West Bank village of al-Mughayyir, in the Ramallah district, injuring eight people with rubber-coated steel bullets while dozens of others, some kindergarten children, were suffered from tear gas inhalation. Local sources told Ma’an News Agency that Israeli forces raided the village as students were heading to their schools, and local residents were heading to work. Soldiers deployed at the village’s schools, kindergarten, local mosque, and several homes. The soldiers’ presence prompted confrontations with local youth, who threw rocks while forces fire rubber-coated steel bullets and tear gas, causing many school children to be exposed to the gas on their way to school. Eight locals were injured by rubber bullets, with one requiring hospitalization for light injuries, according to the Palestinian Ministry of Health. WAFA reported that undercover Israeli soldiers also raided the local boys’ school, during which they beat 10 students and detained three of them. Earlier this month, the Palestinian Ministry of Education released a statement saying that in 2017, at least 8,0279 Palestinian students and 4,929 teachers and school employees were subjected to attacks by Israeli forces. According to the report, nine students were killed, while 603 students and 55 teachers and school employees sustained live or rubber bullets wounds during Israeli raids into schools or by being run over by Israeli military jeeps, while dozens of students suffered from suffocation due to inhaling tear gas fired by Israeli forces against them. 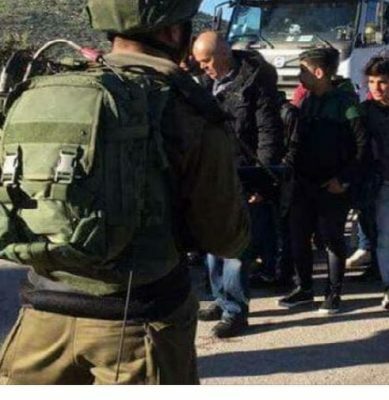 Israeli colonizers attacked and injured, Tuesday, several Palestinian schoolchildren, while heading to school in the Tiwana village, in Yatta town, south of Hebron, in the southern part pf the occupied West Bank. Rateb Jabour, the coordinator of the Popular Committee against the Annexation Wall and Colonies in southern Hebron, said many students suffered various cuts and bruises. He added that some of the wounded students have been identified as Reem Awad, Jaber Awad, Shaima’ Awad, Kifah Abu Jundiyya, Hamza Abu Jundiyya, Inshirah Abu Jundiyya and Ezzeddin Makhamra. The head of Tiwana Local Council Mohammad Rib’ey told the Palestinian News & Info Agency (WAFA) that the colonizers have been stepping up their attacks against the Palestinians, and their lands, to force them to leave. He added that the attack against the children is not the first, and is part of a series of seriously escalating violations. 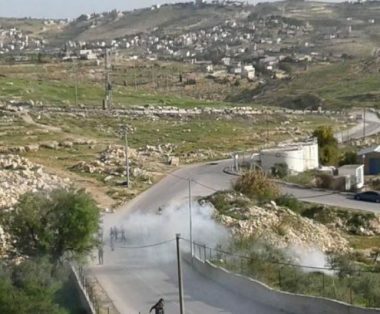 Israeli soldiers fired, on Tuesday morning, several gas bombs at schoolchildren, heading to their schools, in the al-Lubban ash-Sharqiya village, south of the northern West Bank city of Nablus. The children were walking to their schools by the main Nablus-Ramallah road, before the soldiers started firing gas bombs, concussion grenades and rubber-coated steel bullets, and attempted to prevent them from reaching their educational facilities. Medical sources said many students suffered the effects of teargas inhalation and received the needed treatment. The soldiers also installed a military roadblock at the entrance of the village, and interrogated many Palestinians, especially schoolchildren. Furthermore, the soldiers detained a young man from the village, and assaulted him before attempting to abduct him, but the locals managed to take him away. Israeli soldiers attacked, on Monday morning, many schoolchildren with gas bombs, in a secondary school in Teqoua’ town, east of the West Bank city of Bethlehem. Media sources said the soldiers fired at least ten gas bombs into the school, an issue that forced the administration to close all its outer gates, to prevent the army from invading it. They added that the soldiers had no reason for attacking the school, and that the army in constantly deployed around the school, in addition to conducting repeated provocative acts by the soldiers. The school’s administration said the military’s constant presence in front of the school is causing more tension, endangering the lives of the students and threatening the flow of the educational process. The soldiers constantly provoke the students, and search them, in addition to installing roadblocks near the school.